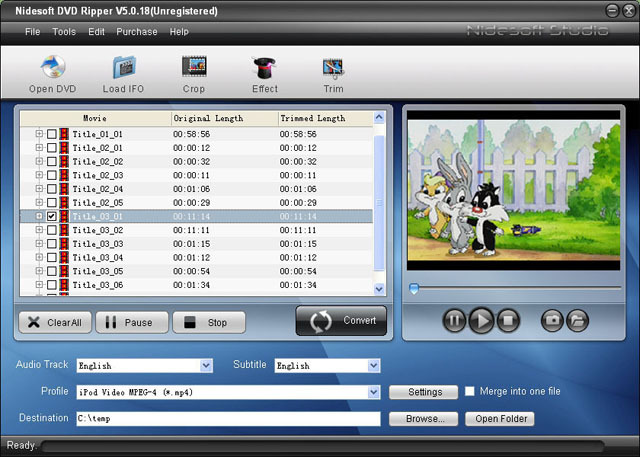 Nidesoft DVD Ripper is a powerful DVD ripping program. Nidesoft DVD Ripper can rip DVD to MP4, AVI, WMV, MOV, RM, RMVB, MPG, MPEG, 3GP, 3GPP, MPG, ASF, FLV, VOB, WMA, M4A, MP3, AC3, WAV, and so forth. With Nidesoft DVD Ripper, you can easily rip DVD to iPod Video, Zune, iPhone, Apple TV, PSP, Xbox 360, PS3, Archos, iRiver, Creative Zen, PMP, MP4/MP3 Player, Smart Phone, Pocket PC, PDA, Mobile Phone, etc. Nidesoft DVD Ripper is DVD Audio Ripper software, It's an ideal solution of ripping concert DVD and convert DVD Video to Audio Formats with excellent audio quality. such as: DVD to MP3, DVD to WAV, DVD to AAC, DVD to M4A, DVD to OGG, etc. 1.Rip DVD onto all popular video and audio players including iPod, PSP, PS3, iPhone, Apple TV (MP4, M4A, MP3), Zune, Xbox360 (WMV, WMA), Archos MP4 Player (MP4), Creative Zen (WMV, MP3, WMA), iRiver PMP, iPod nano, iPod shuffle (MP3), Pocket PC (WMV), Nokia, Motorola Phone (3GP) and so on. 2.Rip DVD to various video formats such as MPEG4, DivX , XviD, AVI, rip DVD to WMV (Windows Media Player), MP4, MOV (Quick Time), RM, RMVB (Real Player), FLV(Youtube), MPG, MPEG, 3GP, 3GPP, ASF, VOB, H.264, M4V, etc. 3.Support video Trimming and Cropping, set the start and end of the DVD movie to get your desired segment. Qweas is providing links to Nidesoft DVD Ripper 5.4.52 as a courtesy, and makes no representations regarding Nidesoft DVD Ripper or any other applications or any information related thereto. Any questions, complaints or claims regarding this application Nidesoft DVD Ripper 5.4.52 must be directed to the appropriate software vendor. You may click the publisher link of Nidesoft DVD Ripper on the top of this page to get more details about the vendor.